Tissot T-Pocket Watches Mechanical Skeleton. Until the end of the thirties, it is considered pocket watches as a real tool for the gentleman, unmatched by the wristwatch. This range of pocket watches Tissot T-Mechanical Skeleton pocket, reminiscent of that era, inspired by the twenties, by class and by details like leather surrounding the band, which provides some warmth to watch. 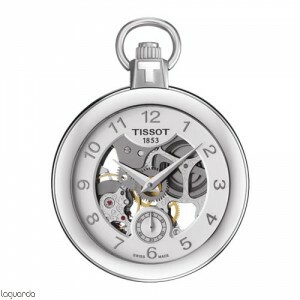 Open heart on the front and back of the watch Tissot Mechanical Skeleton provides a nostalgic feel, reminding us of the stunning craftsmanship of those days.